Size: 6 3/8 x 5 1/2 inches. Sold as a pair with South America. (North America) Chatelain, Henri. c.1735 After Nicolas Sanson II. California is depicted as an island and the area west of the Mississippi River is shown as Mexico. The map has an attractive title cartouche with no text on the verso. Some random, small spots of light foxing, otherwise in very good condition. Burden, No. 324. (South America) Chatelain, Henri. c.1735. After Nicolas Sanson II. Some random, small spots of light foxing, otherwise in very good condition. Attractive title cartouche. No text on verso. 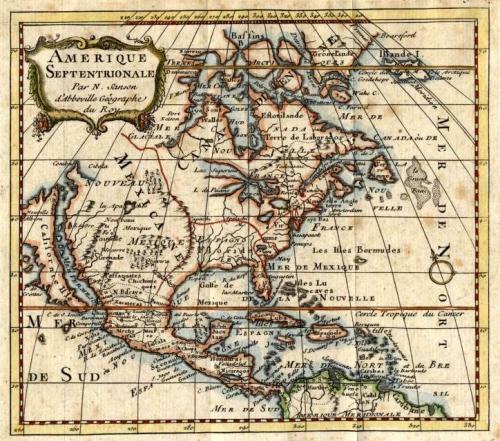 Nicolas Sanson II published a reduced version of his father's famous map of North America. Many imitations followed, with these examples being later ones done by Chatelain.